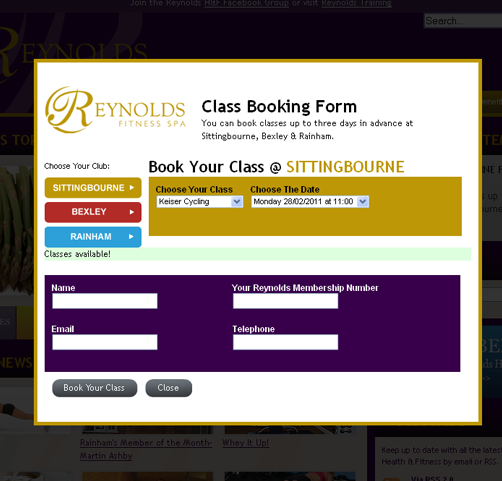 WebPraxis Web Design Manchester have been working alongside the Reynolds Group for over 2 years, and this month the bespoke online gym class booking system we have developed for their Sittingbourne site has been rolled out at their Bexley and Rainham Gyms too. The system allows their health club customers to book classes online, quickly and easily 24 hours a day, giving members the ability to choose their local club, which class they want to attend and the date they wish to attend it. The reporting module available to Reynolds staff will allow them to analyse member’s attendance levels and trends. Reynolds Group is a privately owned business operating a chain of highly successful health and fitness clubs and is an outstanding training provider receiving Grade 1’s across the board during inspection and a Beacon award by the Minister of Education.